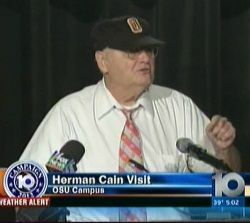 Coach Woody Hayes endorses Herman Cain?? Herman Cain made a campaign stop at The Ohio State University in Columbus on Wednesday 11/30/11 and a Coach Woody Hayes impersonator introduced him. Woody Hayes endorsing Herman Cain? Is that really appropriate for a public college icon? Does this mean that Brutus Buckeye will be endorsing Romney or Newt next? I hope not. The introduction, which was pretty political, seemed to be an inappropriate use of a symbol of a publicly funded University. This entry was posted in Columbus, Football, Media, Politics and tagged 2012 US Presidential Election, endorsement, GOP, Herman Cain, impersonator, Ohio, Ohio State Univeristy, political campaign, Republicans, stump speech, Woody Hayes on December 1, 2011 by Doug. As we come down to the end of the debate on health care reform, I made a personal decision that I hope others will adopt who support a strong public option. 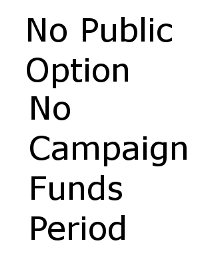 It’s pretty simple – if there is no Public Option in the final bill then I will not donate or support any political campaign for anyone who voted to either water it down or keep it out. I made up a graphic that breaks this idea into a sound bite. This entry was posted in Politics and tagged Congress, debate, health care reform, political campaign, public option on October 8, 2009 by Doug.